Welcome, School of Nursing Alums! Whether you’re a recent graduate or long-term alum, we’re delighted to welcome you to the Stony Brook School of Nursing Alumni webpage. This website is devoted to you with the hope of enriching your relationship with the school. Here you'll find information about the Alumni Board Officers and Board Members, announcements, upcoming events and a link to our biannual newsletter. The School of Nursing Alumni board continues to work hard on building strong and lasting relationships with our current and future alums. We are also using social platforms to stay connected...like us on Facebook, upload a photo on Instagram (sbunursingalum) or send us a tweet (SBU Nursing Alumni). Keeping in touch with our classmates and alumni is a great way to keep our Alumni Association alive and connected. Please continue to check the site frequently for updates. For additional information, please contact Mary Hoffmann at Mary.Hoffmann@stonybrook.edu or me at Tracy.Dourdounas@stonybrookmedicine.edu. Colleen Walsh-Irwin, DNP '92, '95, '14 received the School of Nursing Distinguished Alumnus Award on Friday, March 24, 2017 at the Hamlet Golf & Country Club in Commack, NY. In celebration of her award, there was an all day symposium on "Nursing's Influence on Healthcare: Using Technology to Enhance Outcomes." 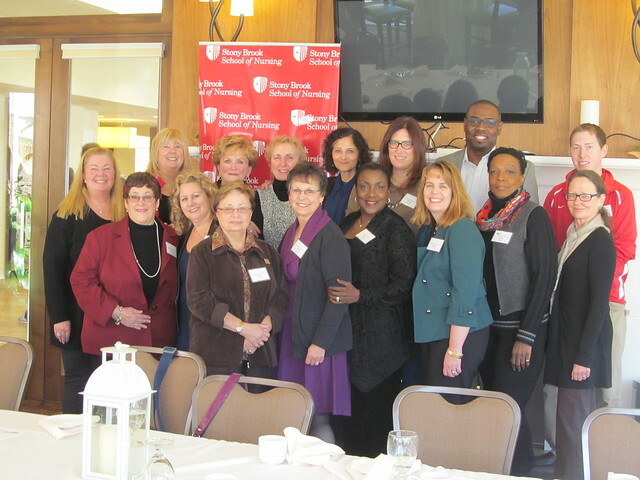 Members of the School of Nursing Alumni Board will mentor Stony Brook School of Nursing recent graduates (graduates of the last five years) as part of the School of Nursing Alumni Mentoring Program. The volunteer alumni mentors are 'assigned' a mentee, who has been selected for the program, in order to provide meaningful support, increase the grad's knowledge of the occupation and ease their transition from nursing school to career. Are you an alum who is interested in volunteering? Are you a student who wants to connect with an alumni volunteer? If you have any questions, please contact Mary Hoffmann at 631-632-4995 or mary.hoffmann@stonybrook.edu. You can play a part in shaping the academic and clinical success of the next generation of Registered & Advanced Practice Nurses.